Of the readings we did for this week (cited below), the one I found most helpful was Jason Palmeri’s article on technical communication pedagogy. In addition to offering a new perspective on disability studies, Palmeri provided constructive ways to help others learn about this field as well. After providing several examples and a discussion of how “cripples” are framed as “burdens on society” and thus marginalized, Palmeri moves to promoting the idea that technical communicators must see disability accessibility “as a source of transformative insight into design practice for all” (57). This sounds like a noble and achievable goal to me, but I have more trouble imaging how it can work practically when he moves in that direction. Palmeri suggests that “we must begin to trouble the binary between normal and assistive technologies” by viewing all technologies as assistive. This makes sense, but when he goes on to say that students should conduct research with a screen reader, I wonder 1) might this activity reinforce that binary? and 2) where the heck do I get a screen reader? Both ponderings, obviously, point to larger questions about understanding and access that I don’t have answers to. Questions of access were at the forefront of several of the materials we viewed this week. Sandhu, Saarnio, and Wiman discuss access at several points, although I was disappointed that they didn’t problematize the idea that laws can provide access until later in the piece. As an undergraduate, I distinctly remember the news staff of the campus paper doing investigative piece after investigative piece in attempts to get the administration to see that the campus was in violation of several accessibility laws. In the end, some administrators agreed but said there simply weren’t funds to right the issues we raised. Sandhu, Saarnio, and Wiman also raise interesting questions about the intersection of poverty and disability. The correlation between the two conditions makes the whole situation much more complicated. These three authors also make a claim when positing that there is a horizontal divide and a vertical divide within the digital divide. They say that Information and Communication Technologies (ICTs) are inaccessible to some because of issues we’ve discussed before (socioeconomic concerns), and this is a horizontal divide. The vertical divide is “the difference between people who are able to use the existing technologies and people with disabilities with little or only partial access to these resources’ (8). I think what we’re dealing with is actually more than a divide. In searching for a better metaphor, it’s almost as though we’re all navigating the surface of a pane of safety glass that has splintered. In terms of technology, there are chasms everywhere. Pamela Walker explore one such fissure in her essay “Artists with Disabilities: A Cultural Explosion.” She makes a good point early on in saying that society expected people who were differently abled to accept their circumstances and make do, and that people internalized that feeling. This struck a chord with me because, although I do not identify with any community of physical disablement, I have internalized the same worldview in terms of socioeconomic struggles. Perhaps this is also why I react negatively to the lyrics near the end of Walker’s essay “We’re not longer grateful for the handouts you have thrown us … ” While I like the metaphorical “moving out and moving up,” the sense of ungratefulness rubs me the wrong way. I don’t have a lot of things and I don’t think the system we live in is fair, but I’m grateful for what I do have. For that reason or perhaps for a reason I still need to find and explore, these lyrics do not evoke empathy in me. Walker’s text was rich with other connections between disability studies and the scholarship I’ve known. Her note on censorship was, I thought, very important. Unfortunately, I fear censorship in some form is happening to disabled artists, because I didn’t find much when I tried to search for the artists she mentions. And she’s certainly right that this has been going on for centuries. Her mention of Hephaestus struck a note of familiarity with me as well. 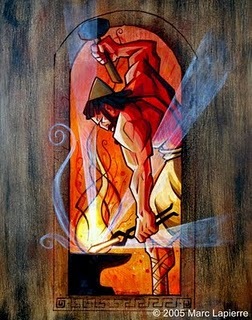 As an undergraduate, I wrote a paper arguing that Hephaestus was the most overlooked of the Greek gods, and he certainly is the most unusual in his complexity. I love the connection Walker makes that Hephaestus, the one god described as lame, is the most well known patron of the arts among the Greek gods. I do take issue with one point in Cromby and Standen’s article: the notion that women are more shaped by standards of appearance in our society than men. I wold argue that this is dependent on individual people. Although there may be a general perception that women are more affected by this, that may only mean that men are in greater danger of acting upon it. Although I mentioned earlier that I do not self-identify as a disabled individual, I have certainly made use of cyborg technologies–braces, dermatological interventions, laser eye surgery–and I have encountered a surprising amount of (not always unwelcome) surveillance in each case. This also makes me think of the video I just watched of “quadraphlegic gamer/artist Robert Florio playing” a video game using mouth controls (found on this site). Although this surveillance was apparently allowed by Florio, it still was a result of his disability. Access, surveillance, control, and dependency are categories that become exponentially more complicated in terms of theorizing (dis)ability. Cromby, John and Penny Standen. “Cyborgs and Stigma: Technology, Disability, Subjectivity.” Cyberpsychology. London: Routledge, 1999. Print. Palmeri, Jason. “Disability Studies, Cultural analysis, and the Critical Practice of Technical Communication Pedagogy.” Technical Communication Quarterly 15.1 (2006): 49-65. Print. Sandhu, Jim S., Ilkka Saarnio, and Ronald Wiman. “Information and Communication Technologies and Disability in Developing Countries.” October 2001. Print. Walker, Pamela. “Artists with Disabilities: A Cultural Explosion.” National Arts and Disability Center. University of California. 1998. Web. This entry was posted in All blog entries, English 467: Race, Rhetoric, and Technology and tagged access, class, culture, gender, race+rhetoric+technology, technology. Bookmark the permalink.